Hey! 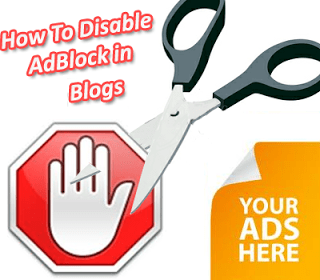 Folks today in this tutorial I am gonna let you know how you can block people who are using AdBlock extension on your site with a message.As you know for most of blogs advertisements are only the source of revenue.But AdBlock is an extension which kills your revenue by blocking ads on your website.Internet addicts install this extension because most of the advertisements especially Pop up Ads annoy them a lot and it leads to bad user experience.According to a report 20% of users who visit your blog have this extension enabled.When your visitors block ads on your site you see a great decrease in your earnings and for bloggers its a headache.If you were interested in disabling Adblock on your site than you have come to a right place.I’ll show you a solution for it and visitors using this extension in their browsers will receive notifications until they disable or remove it from their browsers. How To Identify If Users Are Using AdBlock? There is no easy/straight way to detect users who are using this extension but one way to guess is that your blog is getting huge traffic but earning is low or in your blog stats there are huge views but in ads impression they are low. The only way you can deal with them is by showing a notification in which you force them to disable or remove it if they want to browse freely.If they wont do so they will not be able to view your blog and will keep on receiving this notification.Now let me tell you how you can block these users with a notification.In order to block them you need a plugin named ”Better Stop AdBlock” This is a wordpress plugin (free of cost ) which helps to block users with a notification which can be a text message/image.You just have to install it and then customize it easily using its settings.This plugin is in different language so make sure you have ”Translate” extension installed on your browser so that you should not face any difficulties using it.After installing it I recommend you to watch the video tutorial below. I tried my best to explain you guys about this tutorial and now is your turn to support me by sharing this tutorial along your friends.If you are having any question,please feel free to comment.I’m always here to help you.Dont forget to leave a good feedback about the post.Thanks! Allah Hafiz! Previous articleHow To Write Urdu & Hindi On Your Computer?